I’m just guessing that it’s not coincidence that the theme for Alltech’s Symposium is “The Greenest Generation” and it’s Earth Day. No, couldn’t be. But it is Earth Day and Alltech is talking a lot about sustainability, better environmental practices and feeding the world. 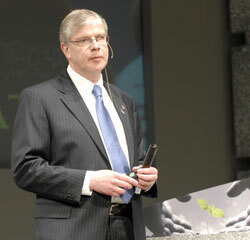 One of those key speakers is Dr. Ronan Power, Alltech Director of Research, who received the Medal of Excellence award. He spoke at the opening general session and I interviewed him after the following press conference.